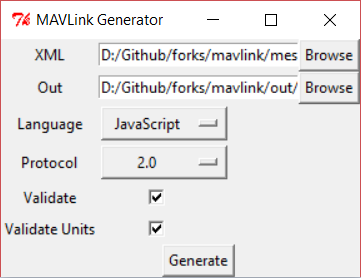 Language-specific MAVLink libraries ("source files") can be created from XML Message Definitions using Python-based command line or GUI generator tools. The supported output languages for each version of the MAVLink protocol are listed in Supported Languages (these include C, C#, Java, Python etc). The tools must already have been set up as described in Install MAVLink (in particular Tkinter must be installed to use the GUI tool). message_definitions/v1.0/ contains XML definitions for a number of different dialects. Dialect files that have dependencies on other XML files must be located in the same directory. Since most MAVLink dialects depend on the common.xml message set, you should place your dialect with the others in that folder. Choose the target XML file (typically in mavlink/message_definitions/1.0). If using a custom dialect, first copy it into the above directory (if the dialect is dependent on common.xml it must be located in the same directory). Choose an output directory (e.g. mavlink/include). Select the target output programming language. Generation will fail if the protocol is not supported by the selected programming language. Optionally check Validate and/or Validate Units (if checked validates XML specifications). Click Generate to create the source files. mavgen.py is a command-line interface for generating a language-specific MAVLink library. After the mavlink directory has been added to the PYTHONPATH, it can be run by executing from the command line. This is the backend used by mavgenerate.py. The documentation below explains all the options for both tools. generation if XML files are known to be correct. --strict-units        Perform validation of units attributes.